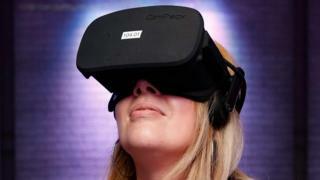 Microsoft has stepped back from suggestions it will bring virtual reality games to its Xbox consoles. When the company announced its newest console, in 2016, it said the device would be capable of delivering “high-fidelity virtual reality”. But, now, it says it does not have any specific plans to bring VR to the Xbox. Rival console-maker Sony has sold more than a million PlayStation VR headsets, but analysts suggest VR sales have generally been slow. Microsoft now says it wants to focus its “mixed reality” efforts on the PC. “We don’t have any plans specific to Xbox consoles in virtual reality or mixed reality,” Microsoft’s chief marketing officer for gaming, Mike Nichols, told news website gamesindustry.biz. In 2016, Microsoft said its next console – then nicknamed Project Scorpio – would enable high-performance virtual reality experiences. However, when the Xbox One X was revealed in 2017, there was no mention of virtual reality at the presentation. At the time, Microsoft’s Phil Spencer told the BBC: “I don’t get many questions about console and mixed reality in the living room,” but said the option was still being considered.